Brussels to stay on lockdown for a week as PM says attack threat still "imminent"
The US State Department said information suggests attacks are planned in multiple regions. BRUSSELS WILL STAY at the highest security threat level for another week over fears of an imminent attack, the Belgian government said yesterday, as the US issued a worldwide terror alert for its citizens. 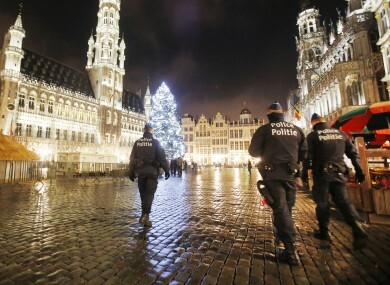 On the third day of an unprecedented security lockdown in the Belgian capital, Prime Minister Charles Michel warned the threat of a coordinated attack in the institutional capital of Europe “remains serious and imminent”. Belgian authorities charged a fourth person in connection with the bloodshed in Paris, when gunmen and suicide bombers killed 130 people in an attack claimed by the Islamic State group, as an international manhunt continued for key suspect Salah Abdeslam. French police sources said yesterday they had found a suspected explosives belt in a suburb near the French capital where the 26-year-old was thought to have been on the night of the killings. The item was found in a dustbin in Montrouge, south of Paris, where a person close to the enquiry said telephone data placed Belgian-born Abdeslam on the night of November 13. Another police source said the belt appeared to have “the same configuration” as those used by the jihadists who carried out the killings in the French capital, the country’s worst such attacks. Ireland’s Department of Foreign Affairs has updated its travel advice for those travelling to France, warning citizens to exercise extreme caution. Irish schools have been advised not to take any groups on school trips to the Île-de-France region. Washington and Paris, meanwhile, stepped up their fight against IS, with France launching its first strikes from a newly deployed aircraft carrier in the Mediterranean and the US calling for more international cooperation against the group. Underlining heightened global fears of attacks after Islamists killed scores in Mali, Turkey and Nigeria in recent weeks, the US issued a worldwide travel alert warning American citizens of “increased terrorist threats”. “Current information suggests that ISIL (another term for Islamic State), Al-Qaeda, Boko Haram and other terrorist groups continue to plan terrorist attacks in multiple regions,” said a State Department travel advisory. In Brussels, an eerie atmosphere hung over the city for a third day with soldiers in camouflage patrolling everywhere, from railway stations to EU institutions. The army and armed police will remain on the streets in coming days, Michel said, but schools and the metro system would reopen from Wednesday. In the normally bustling historic Grand Place, a few bars and restaurants were open for business but they were struggling to find customers. The European Union and NATO, which both have their headquarters in Brussels, said they would bolster security and urged non-essential staff to work from home. As residents in Brussels struggled to get to work by bus and bike, Interior Minister Jan Jambon conceded alert had clear costs and was disruptive, but said it would “continue as long as necessary.” It will be reviewed again next Monday. Meanwhile the federal prosecutor’s office announced that a man who was arrested during a large police operation in Belgium late Sunday has been charged with involvement in the November 13 Paris attacks, the fourth so far. “He is charged with participating in activities of a terrorist group and with a terrorist attack,” the office said in a statement. Mohammed Amri, 27, and Hamza Attou, 20, were charged last Monday on suspicion of helping Abdeslam escape to Brussels after the attacks, while a third unnamed person faces charges of aiding him when he reached the city. Abeslam’s brother Mohamed on Sunday told Belgian television he thought Salah had decided at the very last moment not to go through with his attack mission. French President Francois Hollande said his country was “at war” with IS following the attacks, and on Monday planes based on the Charles de Gaulle aircraft carrier launched their first attacks against the jihadist group in Iraq and Syria. Hollande met British Prime Minister David Cameron in Paris in an effort to widen an international alliance against the extremist group. “We will intensify our strikes, choosing targets that will do the most damage possible to this army of terrorists,” Hollande said, adding that NATO allies Britain and France had a “joint obligation” to strike at IS. He will make his case to parliament on Thursday for Britain to expand its strikes as part of the US-led coalition into Syria in his latest bid to get lawmakers’ approval for the move. In a week of frantic international diplomacy, Hollande is set to meet the leaders of all five permanent members of the UN Security Council in coming days. He will hold talks with US President Barack Obama in Washington today, before meeting Germany’s Angela Merkeltomorrow, Russia’s Vladimir Putin on Thursday and Chinese President Xi Jinping on Sunday. The US on Monday also sought to rally support against IS in a meeting with top representatives from the 65 members of the coalition that has been bombing the group in Syria and Iraq for more than a year. The UN Security Council on Friday authorised “all necessary measures” to fight IS. Email “Brussels to stay on lockdown for a week as PM says attack threat still "imminent"”. Feedback on “Brussels to stay on lockdown for a week as PM says attack threat still "imminent"”.